When we keep the breath in mind in combination with repeating the meditation word “Bud – dho, Bud-dho”, we establish peace in our minds, up to the point where we don’t have to use the word “Buddho” any more. All we wish is simply to know the in – and outgoing of the breath, only that much, fully at ease, with a heart at ease, watching the air coming in and coming out, breathing in … breathing out, knowing it, still and peaceful. With the heart being at ease, certain experiences may come up, experiences as to how we feel our body. There may be the feeling that our body expands, becoming very large, filling out the whole room, the whole meditation hall. It can become so large that it even hits the ceiling. Our body becomes imbued with blissful feelings called piti, waves of joy and rapture rolling on to the shore so that it makes our hair stand on end. We might feel a tingling sensation throughout the whole of our body. When piti is strong, we might experience the body becoming very light, as if it was floating up in the air, there is no feeling of weight at all sitting up there in space. The body is light, the mind is light, still and peaceful. If these experiences in meditation come up for a short time, just for a few moments, they are called kanika – samadhi, momentary concentration. Kanikameans little, there is just a little concentration. If a state like this lasts longer, for example five, ten or fifteen minutes, or half an hour, this means, the heart is entering a state of deeper peace. This is called upacara – samadhi. Upacara – samadhi is a state of concentration that is almost still, or, as it is said neighboring, or touching jhana, almost entering jhana. We continue to develop peace in our mind on the level of upacara-samadhi by knowing the breath coming in and going out until we have the feeling that the mind is still. In this state our mind can be compared to the pendulum of a clock that is swinging a little to the left and right. The mind in upacara-samadhi still has tiny little thoughts, but generally, the mind is peaceful. Sometimes, there are proliferations, the mind is not yet completely still. These small activities of the mind are the knowing of the breath. They are called vitaka and vicara, initial and sustained application of thought. The mind takes up the breath and investigates it. Vitaka and vicara is thinking (not correct term used here, read on) that is being applied to the breath. Piti, (bliss) and sukha (happiness) are feelings that come up in the meditation at this level. Sukha expresses itself in the body being deep and heavy, a feeling of inner satisfaction, a saturated, blissful feeling of contentment, rapture that imbues the body. When pity becomes very powerful, to the point where it reaches its full development, it is called sukha. When sukha becomes very powerful, the mind doesn’t move any more and stays still and calm. It doesn’t move left or right, it is still. In this phase, if we want the mind to think, it doesn’t – it rests in itself. The mind at peace is not interested in the outer world. Sounds from outside won’t attract it, the mind won’t go out, and things from outside won’t reach it. The mind doesn’t accept anything – whatever is the matter, it is uninterested, steadily resting in peace. If the peace of mind has reached this stage, what is called ekaggata arises, one-pointed-ness of mind. Together withvitaka and vicara, piti and sukha the five jhana factors are complete. In this stage there is no thinking – vitaka is not thinking and vicara is not thinking. Only a little remainder of piti stays. Piti and sukha are not very bright and trying to make them become more clearer only makes the mind become more still and peaceful. The still and peaceful mind that is one-pointed like this is very powerful. Now the mind has reached the first jhana. Maybe I’ll only explain up to this level for now. Usually we understand vitaka and vicara as being mere thinking, but this isn’t what it means. Vitaka and vicara need to focus on the breath. If we use vitakaand vicara for all kinds of other issues, we are only proliferating. We need to apply our thoughts and interest on the breath, on the observing of the coming and going of the breath. Vitaka and vicara are only supposed to dwell on a single object, on nothing other than that, so that the thinking is still and peacefulness, piti, sukha and ekaggata can arise. Nevertheless, we may sometimes choose to practice reflecting on other meditation-objects. After having reflected, we can also come to the point where piti arises. Just as when practising Mindfulness of Breathing, when the feeling of piti is still weak, we have reached kanika- samadhi and so on. For example, we can take up Buddhanusati, the reflection on the Buddha as our meditation-object. For this we can also use our morning- and evening- chanting. To recollect the Buddhas qualities means to think of the Buddha, the Lord, who, by his own strength attained full enlightenment, who is pure and free from defilements, self-attained, who possesses the qualities of purity, loving- kindness and compassion in an unexcelled way. If we devote our hearts to these reflections, piti will arise. If it appears in a short, momentary flash, it is given the name kanika-samadhi, if we can uphold it longer, upacara-samadhi.But as concerns the levels of peace and samadhi, all the reflective meditations, the ten anusatis as Buddha -, Dhamma – and Sanghanusati or reflection on death for example, are only capable of giving results up to upacara-samadhi. As they imply thinking they cannot lead into jhana, but they are a good basis for it. If we are skilled in them, sooner or later the power of our concentration grows by itself. With Mindfulness of Breathing or contemplating the Four Elements, it is possible for our minds to enter peace, one-ness or jhana. After having attained jhana, when retreating from one-pointed-ness, the mind re-enters upacara-samadhi . Then we need to take up contemplation of the body. We analyze the hair, nails, teeth and skin of our body in the way our preceptor taught us in the ordination- ceremony. Or, for the lay- people, any of the 32 parts of the body can be used, in whatever way. We take up body- contemplation in order to see the nature of the body. The body simply consists of the four elements, it is just nature, changing according to cause and effect, it is not an individual being, a person or a self and doesn’t belong to anybody. To reflect like this is the way of developing Kayagatasatipatthana, mindfulness of the body, the part of the Four Foundations of Mindfulness that deals with comprehending the body. Mindfulness of Breathing is also a part of Kayagatasatipatthana, and so are the contemplation of the 32 parts, the nine charnel-ground-contemplations, the analysis in terms of the four elements. All these practices concern the body. Further there is the awareness of the body- movements, such as going to and fro, standing, walking, sitting, lying down, standing up, speaking and thinking for example. With all these actions that are related to the body, mindfulness needs to be present. Always bring the mind back to aspects related to the body, don’t think of anything else. Becoming more and more skilled in mindfulness of the body, including anapanasati, leads us to other reflections, such as the ones given in the summary of the section on mindfulness of the body in the Satipatthana Sutta: the body is just the body, not a being, not a person or ours or theirs. Usually we’d see our body as belonging to us, as a person or a personal belonging, but after having meditated on the body, we might suddenly realize: «Eh, suppose I breathe in but don’t breathe out any more or breathe out but don’t breathe in any more, that’s death! What will happen then? We are all subject to the processes of nature». With a peaceful mind in samadhi, we can see reality clearly, we know that this body is not a person or not our self or belonging to us. Our mind will let go of the feeling of self, it will see the mind as one thing and the body as another, both completely different from each other, different aspects of nature. When we see this separation between body and mind clearly, we can let go of upadana, the grasping hold of things. This is what is meant with ‘wisdom arising’, especially wisdom arising from meditation (bhavanamayapanna). The first step in the development of wisdom usually comes from having heard or studied that the body is not self. Thinking about it, we agree, but we don’t really see it ourselves. But if we practise samadhi and reflect coming from a still mind, we begin to see clearly for ourselves. Then we can let go of upadana, as well as desire, aversion and delusion altogether, at this point. We understand how we thought before that our body was ours, now we see clearly that it isn’t ours. The still, peaceful and one-pointed mind at this level of practice can see not-self very sharp. When contemplating on other levels before, one can also see that the body is not self, but on the level of kanika- samadhi it is not as clear. One can also let go, but not as much. One can also analyze phenomena as impermanent, not-self and dukkha and practice letting go, but it will always be letting go on the level of kanika- samadhi. Or, reflecting when entering or staying in upacara- samadhi, one makes use of the strength of upacara- samadhi. Of course, one can also let go there, but it will always be in the range ofupacara- samadhi, though this is already clearer than before. But if the mind can enter the ‘state of being one’, the power of being focused to one point can be used when withdrawing into upacara- samadhi. Reflecting then, one can see very clear and let go very easily. To anyone who comes to this point and practices a lot and makes use of all the potential of practice he has built up before, the Buddha promised, that he will receive the fruits, that he will see the Dhamma for certain- if I remember correctly – in seven years, seven months or seven days. So, if our minds have reached the state of one-pointed-ness and we analyze the body, we will see the Dhamma for sure, we will change our status from being a common worldling to becoming a Noble being. This is, why the practice of samadhi is so important to begin with, it is for the sake of giving power to the mind. Those, who say, «Why is it that our practice bears only little fruit?» can be answered, it is because they still lack a stable firmness of mind. It is lacking because restraint and heedfulness haven’t been developed. Heedfulness and restraint need to be present in order to be able to keep the mind inside and to control it. Practising in this way our mind begins to become peaceful and reaches samadhi. This is the style that the arahant that attains merely through insight (sukkhavipassako arahant) follows. He develops the practice up to the level where the mind attains peacefulness, and then investigates and abandons defilements. The next level that takes the practice higher than this, is the arahant that also attains the Threefold Knowledge (tevijjo arahant). He needssamadhi that is stronger, twice as powerful. He has takes the practice up to the second jhana, and when he withdraws from it, going back into first jhanaand upacara- samadhi, his investigations are even more powerful than before or than in the ordinary state of mind. …But let’s leave this level aside for the time being. Why, even though the mind has reached upacara- samadhi a few times already, doesn’t it go further into one-ness? The reason is, that upacara- samadhi, that has been brought about through investigation or reflections, already achieves peacefulness (though on a coarser level). If the mind has dwelled in upacara-samadhi of the coarse kind to the full extend, the power of the mind will collapse again, just as if it had never meditated before. Then we need to start practising anew, we need to contemplate again, to make the mind go inwards again, meditate again, concentrate on the breath again and continue like this until we have a firm foundation of power of mind. Then we enter the stage of upacara- samadhithat is of medium refinement. We see the body clearly, to the point where we think we can abandon our defilements, cut them off completely. But still, we don’t enter one-ness, the mind pulls out again. So we need to do the same again, until our mind reaches the refined stage of upacara- samadhi. If we dwell in this to the full extent, we can see things very clearly, very distinctly. But already in the medium stage of refinement of upacara- samadhi, we can experience feelings of coolness to the extent of a few months. After getting up in the morning, it only needs a tiny little bit of determination to focus the mind and the mind already enters upacara- samadhi. It may stay there all day. Maybe it withdraws a little from time to time, for example when going to sleep – then the mind closes down as well, but when getting up, the mind is able to instantly pick up upacara- samadhi again. The period of time that one can uphold upacara- samadhi of the medium or the coarse kind depends on the way we use reflection. When we reflect, or listen to the Dhamma, for example the Dhamma about samutti- and vimutti (the conventional level and the level of liberation), we always need to investigate in terms of the mind and the objects of the mind. The mind and its objects are two separate things, but the one who knows knows. We can let go of the objects, we can let go of attachment to the body, we can let go of mind-states. Seeing reality on the conventional level as what it is, the mind has entered the level of liberation. We can compare it to how we see this meditation hall here. It is neither small nor large. On a day like today (where there aren’t too many people) it looks as if the hall is quite spacious, it is not yet full. But at the kathina- festival, for example, or a donation ceremony, the hall seems too small. Actually, the hall itself is neither too small nor too big, it is just what it is, in itself it isn’t anything. A reflection like this makes us understand the world in accordance with reality. Seeing the conventional world as for what it is the mind reaches the level of liberation – being liberated from having to hold on to things. This kind of analysis deals with the outer world, the material world, it makes us see the material world very clearly. When seeing reality the way it really is, our minds may become very focused and collected, maybe even lasting up to three days. The Nine Insight Knowledges (vipassananyanas) occur in these states of mind. One can see the arising and ceasing of conditioned phenomena (sankhara) as it actually takes place. One can watch how they steadily keep on disintegrating, and one realizes the threat and horror both of the inner and outer conditioned world, feeling dispassion towards it. When we are able to see these processes directly, piti and contentment arise in the mind straight away. The external material world would never be able to give rise to similar blissful feelings of delight and being at ease – this is the power of the Dhamma working. A heap of gold as huge as the whole earth couldn’t give the same satisfaction as seeing the Dhamma. At this point, the mind won’t be attached to the material world as usual any more, since it has already seen how much more valuable the practice is. It is worth much more than anything in the world. These insights are all already possible on the coarsest level of upacara- samadhi. The faith and believe in the Buddhas teaching, the inspiration from it becomes stronger and more stable for one who has such insights. Our heart starts looking for a way out of this world, gets more and more dispassionate and the search for sensory gratification starts to lessen – so we increase our efforts in practice. In this phase, after the mind has left the state of upacara- samadhi, it can look like the mind won’t reestablish upacara-samadhi any more the way it did before, when it was capable of upholding upacara-samadhi for months. Now, only from time to time the mind goes as far as reentering upacara- samadhi, sometimes it only goes as far as entering kanika- samadhi. This is the way the practice is at this stage. But the foundation of insights that we have already seen is still the driving force. It is like having fired off the first stage of a rocket shooting out into freedom. The second stage of the rocket keeps up working and firing on. It takes the power of our mind to even higher levels. Whatever type of meditation we have taken up for reflection, whether it is anapanasati, recollection of death, or contemplating the loathsomeness of the body, we have to practise it a lot, develop it a lot. Then our mind will start becoming more and more peaceful. Maybe for a whole year we will experience a state of coolness in our minds. This is a characteristic of peacefulness that can appear, maybe even for as long as two, three or four years. The coolness becomes more and more refreshing until our whole heart is filled with it. A still, peaceful heart is one that can be controlled, that can develop stable mindfulness. Now we start entering the level of upacara- samadhi of medium refinement. At first, we don’t know it – we think that we are about to enter jhana, but again and again it doesn’t work. We have burnt up and cast off the second stage of the rocket, so now we need to fire off the third stage. With all this our practice is becoming stronger, and we increase our efforts to find a way to make our minds more peaceful. It is now, that our practice is developing to the point where saddha (faith), viriya (effort), sati (mindfulness), samadhi (concentration) and panna (wisdom) become firmly established. The Five Faculties or Powers start coming together. This means, that the Seven Enlightenment- Factors (bojjhanghas) start arising. They can already arise from upacara-samadhiof the coarse and upacara- samadhi of the medium level. The Four Foundations of Mindfulness start developing more and more. And liberation starts to unfold bit by bit, up to the level of medium refinement of upacara- samadhi. 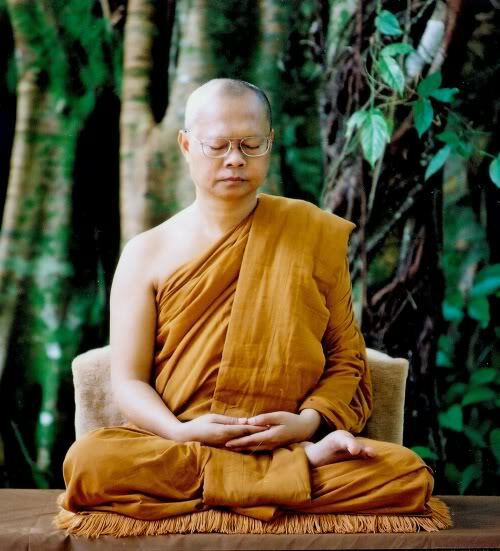 When we start reflecting now, sometimes it only needs a little reminder – for example of death, to become peaceful: «…our life is not secure, death is certain, we need to die for sure when it comes to the end of our lives.» Luang Por Chah used to teach, if we have a lot of greed, anger and delusion and none of the meditation objects work, just think of death. For me personally, when I was newly ordained, I mostly practised Mindfulness of Breathing and reflection on death as basic practices. This is because I still used to fantasize about the future very much. When one is young, one only thinks in terms of progress, one doesn’t think of things declining, so that’s why I took up recollection of death, to think of the danger in the cycle of rebirth, the constant sequence of birth and death. Life is not sure, death is for sure. Finally we all have to die, the end of life is death. Thinking like this, the mind is moved by a sense of urgency and dispassion. We can see it like living in a house that’s on fire: one can’t stay, one has to get out of the house. This is the feeling I had. When I practised at Wat Nong Pah Pong, Luang Por Chah taught us to develop these reflections as a practice in order to prevent the mind following its likes and dislikes. He gave us the means to find the path leading to understanding the Dhamma, so we tried to pull ourselves together to practice accordingly. This meant to be willing to sacrifice, developing dana- paramita, the perfection of the spiritual potential of giving or developing sila- paramita, perfecting the spiritual potential of morality. But even before ordaining, I already saw the difference between the conventional level of reality and the level of liberation very clearly, as I mentioned before. It seemed that, when seeing the world of conventions as it is and dealing with it, the mind had to escape into another world, bringing piti and delight with it, for three days. I didn’t want to eat my meal, so contented, fulfilled and inspired was I. This is why I thought of leaving lay- life, of ordaining. Nekkhamma-paramita, the spiritual potential of renunciation, was developed, to leave in search of freedom from suffering. I was thinking, all the riches of the world don’t really have a meaning, all they cause is worry, stress and grasping. They just increase suffering all the more. My mind wasn’t yet peaceful. If these reflections about reality as it is had been accompanied by mind-states of peace and delight, the Nine Insight Knowledges would have arisen at that point already. The mind in this phase searches for the path to freedom from suffering, and if we constantly keep up the practice, we can even use situations where we have to face crowds of people looking for pleasure and enjoying themselves for reflection, simply bringing up the recollection of death. Whatever object we choose for reflection, we need to maintain thinking of it continuously in order to calm down our minds. Then our mind’s will neither feel attracted or aversed. But the peace of mind that results from this practice still falls under the category of samatha (the type of practice that calms the mind). To reflect on death is still samatha, but it works with investigation and enables us to put things down and does purify our hearts. When our hearts get calmer, merely to think of death or our object of contemplation can take us into upacara- samdhi , where there is peace of mind with only a few thoughts coming up here and then. After the end of my fifth rainy-season I started pactising asubha- kammathana, contemplation of the loathsomeness of the body. Although I had tried a little before, I had somehow determined to focus on it only after the fifth rainy-season. Why, I don’t know – whenever I started trying before, it wouldn’t work. So, after my fifth rainy- season, I took it up, bringing up images of the body being not beautiful and disgusting in my mind. These images then became more clear, to the point of becoming samadhi- nimittas (visions). Sometimes I imagined blood running, dripping down from my moth all down my body, until strong feelings of revulsion would come up straight away. If I developed it further, it looked so real that it would make me throw up. This is what can come about simply through visualization in meditation. When one develops this practice constantly, seeing the body as clearly as loathsome inside and out, eventually gives rise to piti. Seeing the body as impure, the mind gets pure all the more. Piti arises. Then sukha arises – very powerful – and then stillness of mind. The mind enters peace. At first, these visions are called uggaha- nimittas, (visualized images), and at a later stage patibhaga- nimittas, (counterpart images). These are nimittas that one can increase or decrease in size as one likes. In the beginning one analyzes a particular part of the body and contemplates it. Then one can magnify it. The uggaha- nimittas can be turned into patibhaga- nimittas . This is an important stage of practice. If the mind has come as far as this, it is able to separate and analyze the body in terms of the Four Elements (earth, water, fire and air). Seeing the fallen leaves on the ground, the green ones, the brown ones, the black ones, one is reminded of the fact that they all have to turn into earth again. Then looking at one’s body one thinks of the fact that the body also is bound to deteriorate and die, returning to the earth. So one sees the body as earth, being earth element. This feels comfortable, calming and the mind may enter upacara- samadhi or oneness from time to time. The mind is at peace, but hasn’t reached emptiness yet. But when we analyze in terms of the earth element in this way, and seperate the state of being earth as indepedent from the body being earth, the mind can see emptiness. If the peace in our minds becomes more refined we can see the emptiness of the body after having contemplated. Seeing the emptiness of the body, the mind is able to let go of attachments. The emptiness that the mind realizes in this way has been developed through panna (wisdom) and is called tadangavimutti, liberation through reflection on a certain aspect. Samadhi can also bring about emptiness – through the power of suppression. In this case the mind is empty of objects (arammanas), but not of defilements (kilesas). There is still attachment in the mind, still greed, hatred and delusion, but the mind is peaceful, it can force itself to attain peace. The same is true for contemplating things as being elements, it also means to attain peace by suppressing, since greed, hatred and delusion haven’t been destroyed. But still the mind attains to emptiness through seeing how the Four Elements form reality. They are anicca (impermanent), dukkha (unsatisfactory) and anatta (not-self). Emptiness means that we have seen the reality of the material world. The mind is different from the body, distinct and absolutely separate. One can compare it to going to another world, having the feeling of witnessing another world – not the world of conventions, not the world of the I or me, not the world of beings, persons, me and mine, us and them. It is a world that exists of freedom. The mind definitely flies up heading towards it, but cannot reach it yet. It has to return again, back to the conventions. But at least, when we have come as far as this, we will know, that if we keep investigating in this direction many times and get to see things clearly many times, then we should be able to see the Dhamma, realize the Dhamma. This knowledge of the possibility of advancing into freedom is called gotrabhu- nyana. Comparing it to the rocket, it means that our rocket has left the field of gravity of this world and is heading on to another universe. The third stage has already given it the power to shoot on and on. At this stage we are very inspired to practise. Nobody has to remind us to put forth effort, to do walking meditation or sitting meditation, we want to do it by ourselves. When we are inkanika – or upacara- samadhi, nobody needs to tell us about the peacefulness of each state, we find out for ourselves, are motivated by ourselves. This is my experience from the first rainy-season on, and now it is even more. Whether there is something to get or something happening, or not, all we do is practise. Put forth effort, walk and sit meditation until the mind is very peaceful, until it enters peace. Generally upholding the state of upacara- samadhi and then attaining deeper peace, reaching stillness, one-pointed-ness or apanna- samadhi, the mind is very strong. If one investigates then, one can separate mind and matter, see very clearly again, and then – depending on the individual strength – for three days, seven days or a month experience clearly the coming together of the Noble Eightfold Path (magga samggi). This leads to seeing the Buddha in one’s own heart, seeing the Dhamma and the Sangha, without any doubt. The mind dwells in liberation three days, seven days or more than that. The ways of the world are one thing, the mind is another – worlds apart. The mind sees things in the light of vimutti all the time. When the mind’s power has been used up, it falls back into its former state, but it won’t doubt any more about the path leading to peace, since it has already experienced emptiness, seen emptiness, or – as we say in the conventions of language – has seen Nibbana. The mind has entered the stream of Dhamma – one can find many names. If someone has come as far as this, he won’t doubt about how to continue his practice. In the beginning, though, the question is only, how to developsaddha (faith). As to what concerns the fruits of the practice, they will ripen by themselves. Luang Por Chah expressed this process comparing it to coming into this sala (hall) here. To explain, what is inside the sala is solely for the sake of arousing the people’s interest in going inside for themselves – afterwards they will understand on their own. So all we need to do now is to ask ourselves how to get our minds to be interested in meditation, to be interested practising to know the breath, to be interested in looking at the body and developing peace. When the mind is peaceful, things will happen by themselves. This is my advice for developing the practice of samadhi. So the experience of emptiness can happen in either way, through the peaceful mind that comes from using reflections, or through focusing on knowing the breath in order to quieten the mind. Although emptiness can be attained merely through samadhi, the way of developing emptiness through the use ofpanna is the stronger one, as it implies letting go of grasping. This is emptiness on the level of liberation, or in whatever way one likes to call it on the conventional level – one can call it emptiness that arises through having uprooted grasping. What are the advantages of this practise? When the mind has reached emptiness in this way, one doesn’t have to do anything any more, one doesn’t have to focus on anything anymore. If the mind is in upacara- samadhiof the coarse kind and we let go and liberate it even more and the power of mind is stronger, the mind will be in upacara- samadhi of the medium level without having to do anything, it is there already. If our power is even more, then the mind will accordingly be in upacara- samadhi of the refined level. This is the way the power of the mind works. Upacara- samadhi of this type is freed of defilements already. The samadhi that one attains for the first time is different from this, it is emptiness through suppressing things until the mind attains to oneness. When one investigates afterwards, one can eradicate defilements as well, and emptiness arises again, but of another type (than in oneness). This time the state of emptiness is a state of purity, it is samadhi that automatically arises through the purity of mind – a very light state of body and mind. In the beginning practising samadhi is difficult. If one has samadhi, but then encounters with negative mind-states, the samadhi disappears. So one has to reflect more. Having reflected a lot, the samadhi is gone even more. The power of mind is not strong enough. That’s how it is. One becomes tired both with focusing and investigating. But, please be patient. If one experiences dukkha in the present, one will experience sukha as result. One has to be patient, keep being patient and one will receive the fruits later on. So, let all of us, who are practitioners of the Dhamma, bound in the fetters of the world, but born as human beings who have met the Buddha’s Teaching put forth effort in the practice of meditation for the sake of encountering the Dhamma in our hearts. Everyone of us.